The top featured in the image to left is the second effort that I’ve made with this pattern. I modified the pattern considerably by shortening the sleeves, taking in the sides, shortening the tail, and lengthening the front. I’m still not happy with the results, and I think I’m going to give up on this one. There are too many patterns to try and too little time to spend so much on one unsatisfactory pattern. I made the monks cord, shown to the right, used for the “buttonhole”. It’s really quite easy to wind the cord using the bobbin winder on your sewing machine. After much consideration, I’ve decided to change my rating of this pattern to “Would NOT recommend”. There’s only one size in the pattern, and that size is enormous and ill-fitting. The instructions are poor. The results do not look like the garment on the pattern envelope. This pattern is not for beginners. While construction is very, very easy, the instructions are patchy. They assume a certain level of skill and knowledge. For example, no button markings are given, andthe instructions tell you put in the buttons and buttonholes with no additional information. In addition, only one size is given in the pattern. I am 5′ 7″ (164 cm) tall, mostly leg, but I was weighing about 195 pounds (89 kg), before I got pregnant. I’ve gained about 40 pounds (18 kg). When I got the pattern, I was concerned that it wouldn’t be big enough to go around my DD bust. It’s plenty big. I usually sew an 18 for my shoulders and a 20 or 22 for my bust in New Look patterns. Oh, and I wore the jacket the other day, it fits my very pregnant body. neckband is put on or the pattern or what. I made my mother try it on. She’s my height, but she weighs 120 pounds, and wears a RTW 8 or 10 with a barely A cup bust. It fit her really well in the neck, too. I was testing Mary Lou Rankins assertion that this pattern could fit many sizes at once. 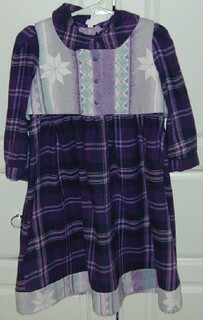 In the unaltered pattern, the sleeves are too short and the front is too short. I’m not sure if the front is short because I’m so big busted or because of my height. I had my mother try on an altered pattern, where I’d shortened the sleeves and lengthened the front, so I couldn’t make any conclusions about the effect of a large bust. I think the sleeves are supposed to be short. You definitely need shoulder pads. This is a pattern for drapey fabric. I made the first jacket out of flannel and chamois. And while those aren’t stiff fabrics, they aren’t as drapey as a soft rayon, for example, would be. In the flannel/chamois, the jacket stands away from my body, making me look bigger. 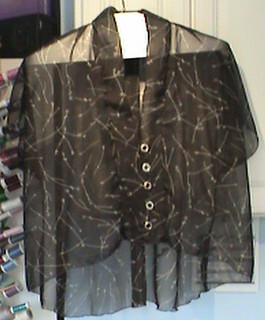 I made the 2nd shirt out of a very drapey, sheer, cheap polyester. This is a test garment. I’d made a couple of alterations, so I wanted to see how it came out without breaking the bank or using a fabric that I like. It made a huge difference. The shirt fell in attractive, drapey folds over my pregnant body, and it looked nice on my mother, too. I made the first jacket exactly as the pattern called it out. After seeing MLR at PIQF and going thru the samples she brought, I decided to try this pattern in a short sleeve version I also lengthened the front and shortened the back. I was concerned, at first, about making the alterations to the facings, but it was easy to copy the curves from the front and back pieces. And in the end, I used a rolled edge on the lower hem, so I didn’t need the facings. So now, I’m very pleased with the neck and lower hem. I didn’t like the front being above my belly button and the back came down to my knees. The back is still longer than the front, just not as extreme. After attempting the short sleeves, I’m convinced that the jacket is too big for me in the bust. It could just be that I don’t like all the fullness there. I wanted to have cap sleeves on the short sleeve version, and that’s what I got, but they came down to my elbow. If I want to make them shorter, I’m going to have to bring the armpit in some. This pattern is for the adventurous. I’m not sure why I like it so much, but I REALLY like it. I think it has great potential, if I can get the fit I want. Maybe what I like is that MLR is a wonderful inspiration. She’s very approachable at PIQF. She will take time and talk to you. If you e-mail her, she will reply. She encourages you to make the pattern your own. I also like that the results from the pattern can look so unique. UPDATE (3/9/04): Reviewed for Stash Contest. This time I made the skirt out of some 100% polyester knit moleskin. It’s VERY short on DD. I choose the patterns based on her height, adjusting the waist elastic for fit. I think it needs to be lengthened 2 inches. UPDATE (2/25/04): Reviewed for stash contest. The pattern is now out of print. I couldn’t find anything similar at New Look or Simplicity. I made the tank top for DD. It was very easy, only 2 pattern pieces. The back is a 2 piece back, so there were a total of 3 pieces. 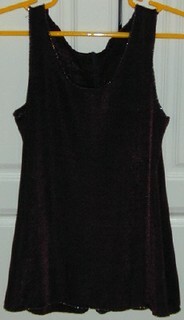 Instead of a facing like on the dress, the tanktop instructions call for a 3/8 inch hem. What do people do who don’t have a coverstitch machine? I mean, I had to snip the hem allowance to get it to turn. The coverstitch covers this pretty well. I like binding better, I think. Maybe I’ll do that on the next one. I used a pink with blue flowers cotton lycra knit print that I bought at least 2 years ago to make nursing tops. This is a great pattern for knits, and it worked great with the slinky knit. 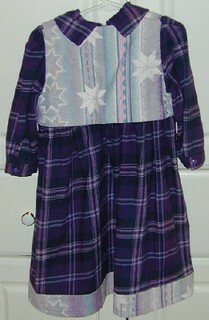 My only problem was that I had just made a Kwik Sew top & skirt for myself out of the same fabric,and I forgot to use a 5/8″ seam allowance on the kid’s dress. It wasn’t a biggie, and I was very glad it happened that way instead of the other way around. I did all of the construction on the serger using the 4-thread-safety stitch. Because the dress is so little, it literally took minutes to sew all the seams. I decided to eliminate the facings. I hate facings. I think they makes things look homemade in a bad way. Instead I finished all the hems with a 3 thread rolled hem stitch on the serger. 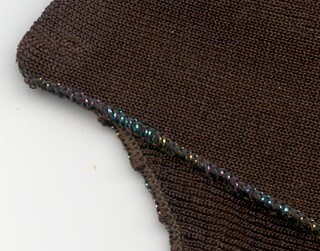 This was the first time I used a metallic wooly nylon to edge a garment. It came out wonderfully. I did not use any stabilizer in the neckline. Since toddlers outgrow things so quickly, I decided this wouldn’t be a problem. Unfortunately, DD is on a dress strike and refuses to wear it. This dress is so cute, but not overly frou-frou, and with the vest, you don’t have to worry about matching plaids. I’m too impatient to do that. However, if you do decide to go with a plaid, I’d recommend making sure you can straighten the fabric before taking the plunge. This was my first plaid garment, but it was not the first time I dealt with a fabric that was off grain. Unfortunately, I was not able to straighten the fabric. You can see the drift in the image. 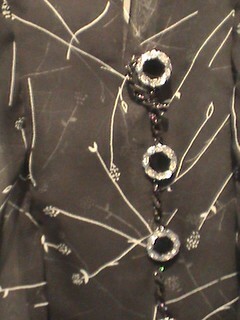 Even though I was not able to straighten this fabric, I decided to make the dress out of it anyway. So far, no one has commented on the fabric being off grain. The instructions are good, and the sewing is easy. However, the sleeve cap is way too big for the armhole. I gathered it as much as I could, and it was still too big. I had to do some major trimming. I would rate this as “I would definitely sew again”, but DD is on a dress strike. Unless it’s hot pink, she won’t wear anything but knit pants and t-shirts. Maybe by the time she’s in a size 8, I’ll be able to make it again, if it’s still in fashion.